Very little is known about the Dutch artist, Johannes Vermeer. Over a period of approximately twenty years the artist produced just thirty six known paintings; some very small (just 8x7 inches) and some of moderate size. The largest of his known works being 63x55 inches. There is some controversy over whether the two smallest paintings are true Vermeers or nineteenth century fakes. One painting (St Praxedis) is a virtual duplicate of an original 1645 painting of the same name by the Florentine painter, Felice Ficherellian. As such it did not seem to be worthy of a poem, as all of the included poems are aimed at capturing the spirit of Vermeer in different ways. One painting, `The Concert' is currently missing (stolen in 1990), and of all those paintings attributed to Vermeer, only twenty one have legible signatures. The one on `Diana and Her Companions' has been worn away during acts of restoration, and not all of the signatures on the others are thought to be genuine. 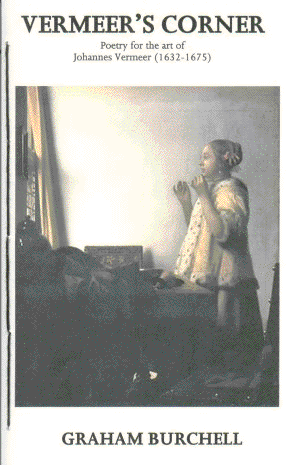 I bought a small book of Vermeer's paintings at a bargain price. I actually started reading it, and not just looking at the pictures. I was an art teacher for many years, but I knew very little about Johannes Vermeer. Nor does anyone else it seems. I was fascinated, firstly by the enigmatic nature of the artist and his work and secondly by the stunning beauty of his paintings. Hardly anything is known about Vermeer. He has thirty-five known paintings of which one is stolen, missing from a museum in Boston. Women and more significantly, women wearing pearls is an intriguing aspect of his work that seems to be largely about the place and plight of women in 17th century Holland. I became so absorbed by the artist, his work and his time that I resolved to write a poem about each one of his paintings. In all of the poems the speaker is a character (or in some cases - the character) in the work. This was often the woman or one of the women posing. Sometimes the woman was his wife or his daughter either talking directly to the reader or to Vermeer. Occasionally the speaker is a man. In two of the poems `The Procuress' and `The Music Lesson', the man in question is Vermeer himself. Graham Burchell was born in 1950 in Canterbury, England. He has a B.Ed in Art and Education from the University of Sussex. He is the winner of the 2005 Chapter One Promotions Open Poetry Competition, Winner of the 2006 Hazel Street Productions Poetry Contest, the runner up in the 2005 'Into Africa' International Poetry Competition and a runner up in the 2006 Ware Open Poetry Competition. He was a 2006 Pushcart Prize nominee. His poetry has appeared in many print and online literary magazines. He is the editor of the online poetry journal, Words-Myth. As a teacher he lived in Zambia, Saudi Arabia, Tenerife, Mexico, Paris (France) and Chile, as well the U.K. He began to write fulltime from 2004 as a resident of Houston, Texas. In October 2007 he returned to live in England in the small seaside town of Dawlish. is an 56 page hand-stitched paper book with spine.